Sunrise near Hilda. The red sun hangs through hazy clouds and lark sparrows are starting to sing. In a local farmyard surrounded by sunflower fields a small group of paleontologists stir in their camp. Today is supposed to be the big day when five years of hard work and effort pay off at the nearby Hilda Mega Bonebed. 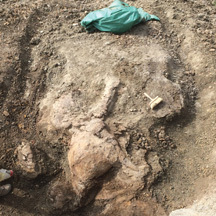 A one-ton fossilized skull of a Chasmosaurus kaiseni, a rare ceratopsian, is to be airlifted by helicopter out of the river hills to the flatter prairie above for transport by flatbed to the Royal Tyrrell Museum. From there it will go on to the Canadian Museum of Nature in Ottawa for cleaning and years of intense study. Lead researcher Jordan Mallon, however, comes bearing the bad news. No helicopter today. The pilot has cancelled his hour-long trip down from Calgary over weather concerns. The team is disgruntled, but after a cup of coffee decides to head down to the site anyway to prepare the site in case rain comes in the afternoon. The four man team crowds into a pick-up truck and heads down the gravel road which eventually gives way to a bare prairie trail. On the way out, Mallon explains why the Chasmosaurus kaiseni is considered such an important find. “It’s a horned dinosaur. Everybody is familiar with Triceratops, and the Chasmosaurus is similar,” he says. “It’s got two longer horns over the eyes, a horn over the nose and a frill coming over the head… Chasmosaurus differs from Triceratops in being a little bit smaller, and it has a very lightly built frill… Chasmosaurus is a fairly common species, but what we’ve got here is a Chasmosaurus kaiseni, that’s a long-horn type of Chasmosaurus, and that species is quite rare. The exact location of the Hilda Mega Bonebed is a closely guarded secret within the local ranching and academic research communities. Any visitor who comes out has to agree to keep it that way to ensure the integrity of this important Late Cretaceous site. The pick-up truck parks at the top of hill near a gas wellsite. Geared up for a hike, and carrying various prybars, shovels and pick axes the team descends single file down a steep ravine where the footing is anything put secure. Slipping and sliding at moments, the team heads toward the “muddy” zone of the local badlands. This location for such a major find is highly unusual, says Mallon, and doesn’t generally lead to the best preservation of fossils. “A little further down you see all this whitish, covered rock,” he says pointing it out. “It’s a type of sandstone formed in the rivers 75 million years ago. We tend to find most of our best fossils in these channel deposits… Where we are standing right now, we are a little higher up. Arriving at the site, the white plaster covered skull surrounded by black lift netting is situated on a steep grade. As the crew members try to dig around the skull to form a water channel to drain potential rain water away from the site, Mallon leads the way up the ridge to the even steeper Hilda Mega Bonebed. As he travels along he picks various pieces of ceratopsian and theropod bones off the ground to show. To the laymen observer they look like shards of white rock, but closer inspection reveals vascular channels running through fossilized bone where there were once veins. Mallon says it is these kind of indicators he is looking for when deciding to dig a site or not. In the case of the Hilda Mega Bonebed the problem isn’t that there are too few clues in the landscape pointing toward potential dig sites, the problem is there are too many. Mallon uncovers one section of the frayed blue tarp which covers what he has dug over the past five years, and immediately the frill of a juvenile ceratopsian is instantly recognizeable, even to the untrained eye. 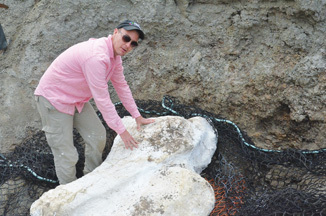 Smiling broadly, Mallon says it is this moment of revelation paleontologists live for. “When you see a full frill like that right there, intact and in front of you, it’s like ‘Eureka,’” he says. Lead researcher Jordan Mallon explains some of the unique features of the Chasmosaurus kaiseni fossil he discovered near the Hilda Mega Bonebed. Off to work at the Hilda Mega Bonebed. 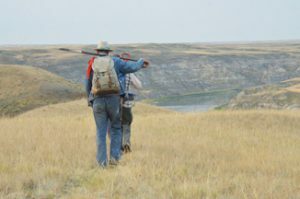 Researchers have to make a challenging trek to get down to the bonebed, the exact location of which is a closely guarded secret. Chasmosaurus kaiseni skull prior to plaster being applied.